1. The Westin Tempe has officially broken ground in Downtown Tempe on Seventh Street between Mill and Myrtle avenues. 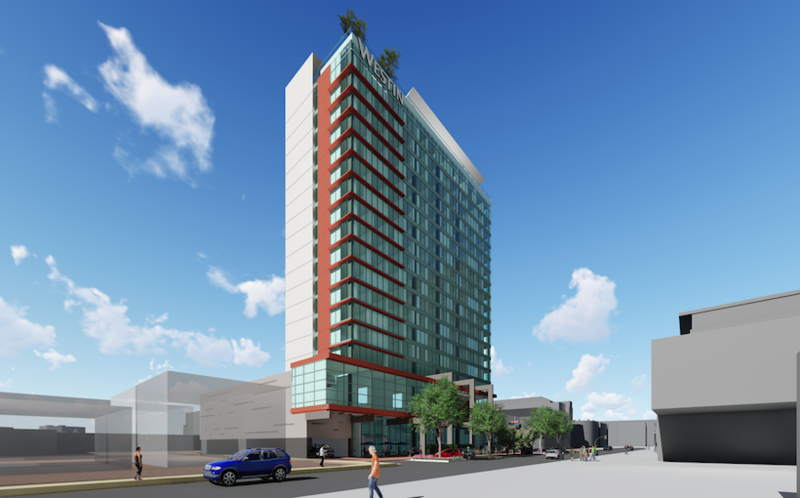 Developed by CAI Investments, the 18-story Westin Tempe will be a full-service business hotel. 2. Ottawa University-Arizona officially broke ground on its new athletics center last week. The O’Dell Center for Athletics was made possible from a $6M donation from alumni Jim and Jeanne O’Dell, the single largest donation in the school’s 152 years. 3. The Ellsworth Road project, which broke ground last week, will improve the flow of traffic and safety on Queen Creek’s most traveled roadway. The project coordinates the town’s improvements with four development-related projects along Ellsworth Road. 4. After more than 15 years of planning and two years of promotion, a ceremonial groundbreaking was finally held for the 205-room, 20-acre Ritz Carlton, Paradise Valley resort on Feb. 20. 5. Greenberg Construction has announced the completion of Aviation Row in Chandler. The 44KSF concrete tilt office/warehouse includes stained concrete, elevator, and a Class A lobby with adjacent offices and open work areas. The warehouse includes a three high-bay aviation parts facility. 6. Gorman & Company, Inc., in partnership with the Affordable Rental Movement of Save the Family, the Arizona Department of Housing, the City of Tempe, Maricopa County and the U.S. Department of Housing & Urban Development, has announced the completion and grand opening of the 50-unit mixed income rental community Valor on Eighth Apartment Homes. The development includes five live-work units on the ground floor and 45 multi-family units designed to accommodate veterans and their children. Cai Investments finances, develops, and manages properties across key markets in the United States. We are a fully integrated company with approximately 20 employees, managing the entire real estate development process.